This year the Stratford Festival has mounted a gorgeous production of Noel Coward’s perennial favourite, Blithe Spirit (1941). I don’t think Charles Condomine and his second wife Ruth have ever been haunted by Charles’s first wife in so sumptuous a living room as the one Simon Higlett has designed or that Ruth has had quite so large a wardrobe on display as Katherine Lubienski has created. Director Brian Bedford certainly knows this play. He directed at Stratford in 1982 with himself starring as Charles. In that production, as in all others I’ve seen, Charles is the central character. In this production, however, Ruth strangely enough becomes the central figure, and that is only one quirk that prevents this irreverent comedy about death from being quite as funny as to ought to be. For those who may not have encountered the play before, the action concerns the successful writer Charles Condomine (Ben Carlson), who has been married for five years to his second wife Ruth (Sara Topham). This is the second marriage for both of them Charles’s wife having died young, Ruth’s elderly husband having died old. Charles’s idea for his next novel is to have a medium as the murderer and so he has arranged for the village’s local medium, the eccentric Madame Arcati (Seana McKenna), to come by and hold a séance. For the quorum needed for a séance he has also invited over his friends Doctor Bradman (James Blendick) and his wife (Wendy Thatcher). Charles and his friends all believe spiritualism is hokum and Charles only hopes to learn some jargon and tricks of the trade from the séance. He gets rather more than he bargained for when Madame Arcati successful causes Charles’s first wife Elvira (Michelle Giroux) to materialize. From then on the comedy focusses first on Charles’s attempts to convince Ruth, who cannot see or hear Elvira, that Elvira has really come back and second on everyone’s attempt to get Elvira to return to the afterlife when she clearly doesn’t want to. In this not so faintly misogynist parable about what torture it would be for a man to live with two wives, the man normally would be the focus. Coward notes more than once that Charles is “dominated by women” and it is perhaps this notion that Brian Bedford relies on for his interpretation. Ben Carlson does not present Charles as the usual strong male character one finds in other Coward plays. Ruth seems to best him in any contest of wits. When he exasperatedly tries to convince Ruth that Elvira has returned, he does not seem like a strong, self-secure man brought low by a strange occult event, but a weak man whose weakness the event exposes. The result is that the comedy of Charles’s situation is not as great as it ought to be. Ruth thus emerges as the strongest character in the play after Madame Arcati. Rather than a play about a man dealing with two wives, the play becomes one about a second wife dealing with a raving husband and his invisible first wife. Under Bedford’s direction we follow Ruth’s approach to the unusual situation much more closely than we do Charles’s. The problem with this is that Ruth’s approach is not as interesting. She remains in various levels of irritation with Charles and Elvira from first to last. This difficulty is made worse by Sara Topham, who expresses Ruth’s irritation at so high a level when it first appears in Act 1, that she has nowhere to go to modulate her frustration as the events she encounters become increasingly exasperating. For her part, Michelle Giroux is lithe and sinuous and strangely low-key. She is excellent at communicating Elvira’s anger at having been summoned so abruptly from the afterlife, but she gives no hint of Elvira’s mischievousness, so essential in understanding what happens later on in the action. Madame Arcati has always been a plum role for an elderly character actor. Coward wrote the part for Margaret Rutherford, the comic actor with a face that looked like a John Tenniel caricature for a Dickens novel. 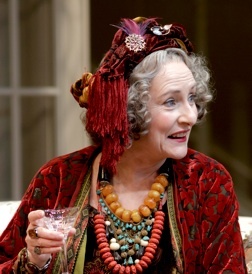 In New York the role was taken over by Mildred Natwick, anther loveably odd-looking actor. The fact that Stratford has cat Seana McKenna, one of its lead actors, in the role simply shows how few elderly character actors he Festival employs. McKenna makes a great effort in portraying Arcati’s schoolgirl enthusiasm and eccentric behaviour, but these are qualities that should appear as effortlessly natural to the character. Another aspect McKenna can’t help missing is Arcati’s age. Though she is constantly referred to as “old girl”, McKenna is manifestly younger than James Blendick and Wendy Thatcher, who play the Bradshaws, when she should seem to be at least their age, if not older. The humour of the character is that this elderly woman has a zest for life lacking not only in the staid people of her own generation but also in the equally staid younger generation as represented by the Condomines. The misconception of the role is reinforced when we read that the even younger Monique Lund is McKenna’s understudy rather than Thatcher, who would have been he more logical choice for the role in the first place. Besides the solid performances of Thatcher and Blendick as the stolid Bradshaw’s, the other actor who gets her role exactly right is Susie Burnett as the Condomine’s over-enthusiastic maid Edith. I haven’t seen anyone find so much varied humour in this role as Burnett does. This is an attractive production beautifully lit by Paul Miller that may seduce many simply through its visual splendour. Women oohed and aahed over the smart new outfits that Topham wore for every new scene. For those who have never seen the play before and are seeking light entertainment at Stratford, this will serve them well. Those who have seen the play before will know that the comedy can be much more nuanced and much more deliciously amusing than Bedford presents it. It certainly doesn’t displace the 1993 production at the Shaw Festival in my mind with the ideally cast Jennifer Phipps a Madame Arcati. In its search for a younger audience one can’t help notice the lack of older actors among the company at Stratford and the serious deficit of experience and appropriate casting choices that entails. Photo: (top) Michelle Giroux and Ben Carlson; (middle) Seana McKenna. ©2013 David Hou.